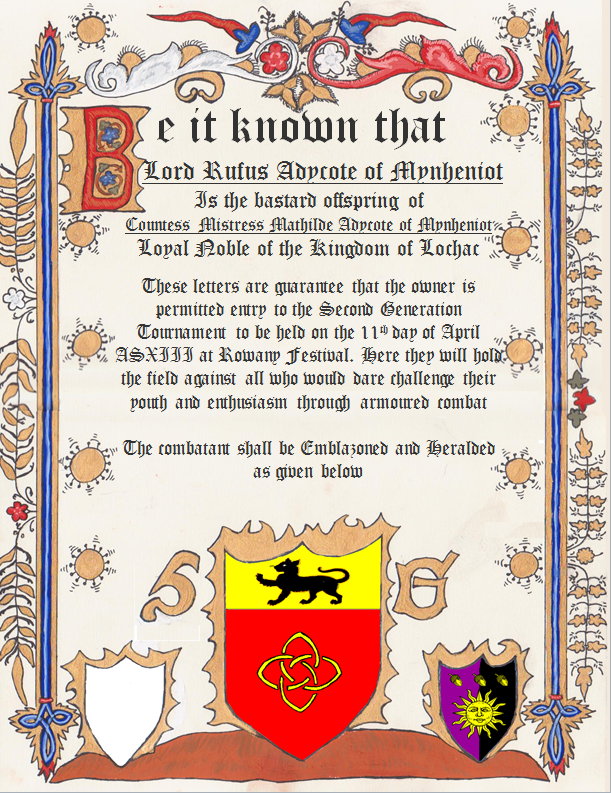 My consort, Lord Jonathon of Loch Swan, decided to host a second generation tournament at Rowany Festival 2009. The idea is that those second generation SCAdian fighters, i.e. those whose parents also participate in the SCA (and often those who have grown up in the SCA for a significant portion of their life), would hold the field against all comers. The announcement Jonathon made was most amusing and emphasises the fun and banter intended by this style of tournament. As such, I’ve included it at the bottom of the page (in italics). 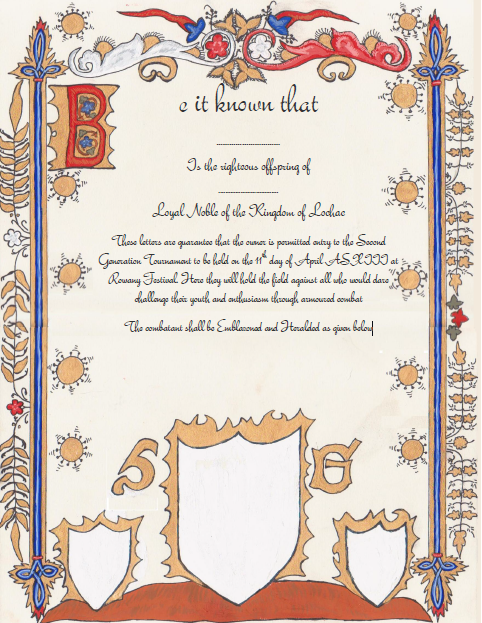 For this tournament, he asked that I make a scroll template for the second generation fighters to add their devices to as a token for participating in the tournament. I had never done any scribe work at this time. Looking through books of illumination, I took some designs from extant pieces. Unfortunately, I did not record the sources anywhere. This was a very rough piece of work, however, it achieved its purpose and the second generation fighters seemed enthusiastic about it. First, I drew the design in pencil and then painted it on using acrylic paints. 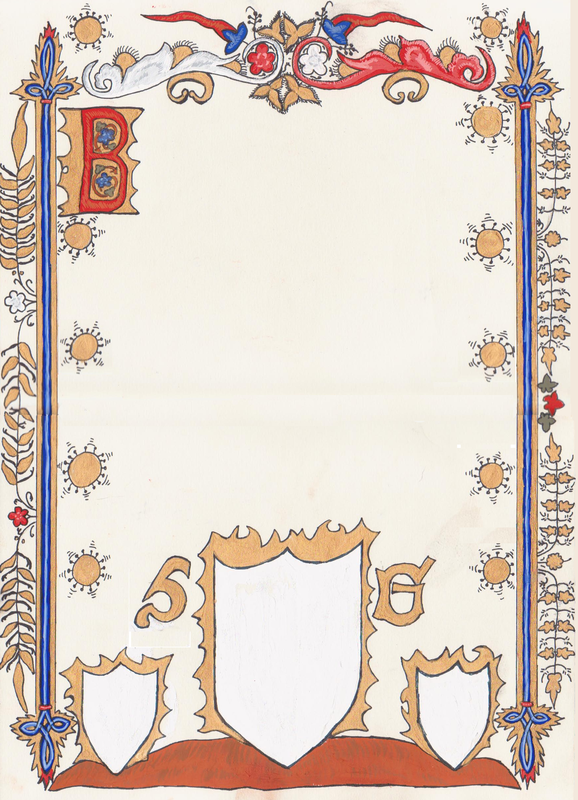 Second generation tournament scroll for 2009, painted and digitally altered by Ceara. Then, I added text electronically using Microsoft Word. Text was added electronically to the scroll. I notice in retrospect that I wrote the date as ASXIII… which is well off the actual date. Oh well. For those who didn’t notify us before Festival – blank spaces were left for the participant to write their name, and their parent/s names, on the scroll. I took textas to Festival and shared them around so that the participants could draw their heradlry (on the large shield), and that of their parents (if they wished, on the smaller shields). Again, this seemed to be well received and many of them coloured in their scrolls. I know it is not a particularly period way of achieving this goal, however, I did the best I could with my knowledge, time and abilities at the time. I think it is a novel idea for creating quick tokens for less formal activities in the SCA. The might and power of all Lochac’s proud sons and daughters sees them take to the field challenging all comers to combat. The time has come for these sons and daughters to stand united and claim what is rightfully theirs!.. No longer to wait until it is given to them, it is time to take! If you care to take the field against the youth and exhurbriance of Lochac details are below, specatators are also welcome to witness the glorious tales of victory and watch the next generation of Lochac test their courage against their elder oppressers. 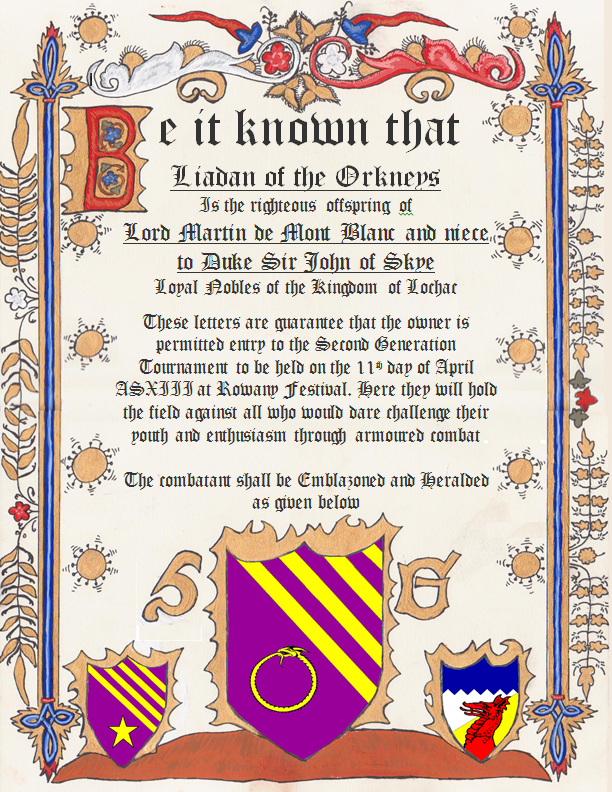 Notes: Children of SCA parents who are duly authorised shall challenge all other members of the populace to test their virtues in combat by holding a Pas d’ Armes. The Generation Next fighters run a custom heavy combat scenario. 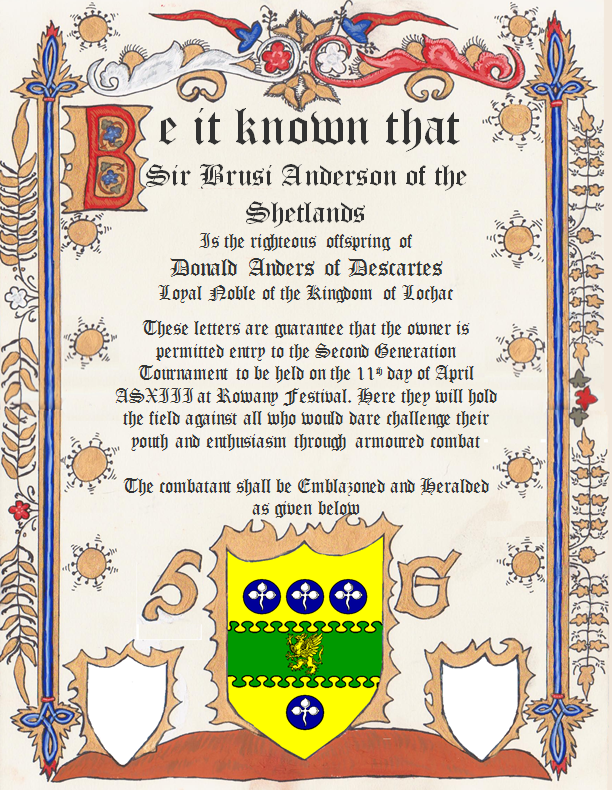 Scroll for Sir Brusi Anderson of the Shetlands. 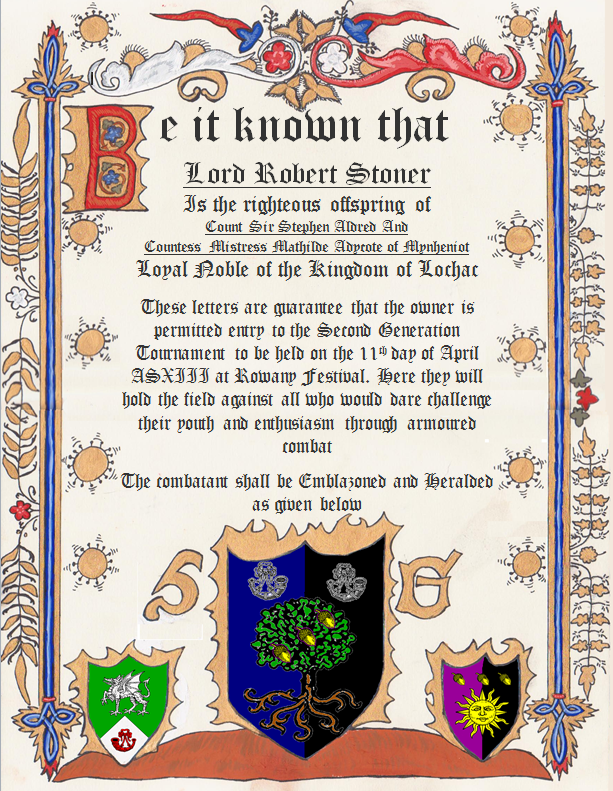 Scroll for Lord Robert Stoner. 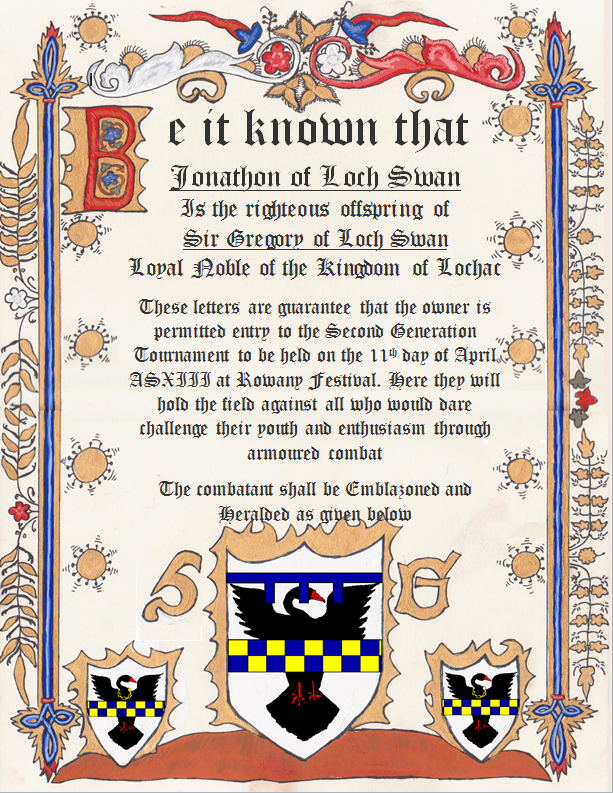 Scroll for Lord Jonathon of Loch Swan.